Bride of the Stripping Dead! 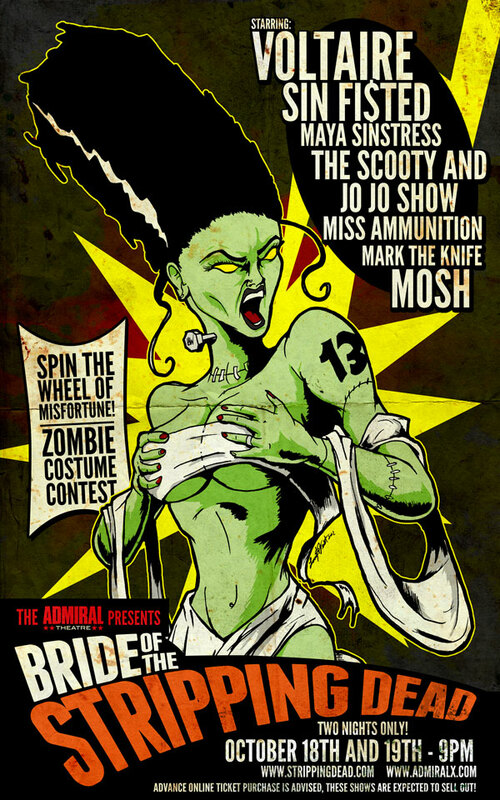 The Admiral Theater in Chicago, IL contacted me about doing a poster for their event, “Bride of the Stripping Dead.” It was a ton of fun to do and the scope was pretty simple: Do a poster of The Bride of the Frankenstein as a stripped with a ton of attitude! I wanted to keep the look of terror everyone was familiar with, but I also wanted to do something kinda nuts. Over the course of a few weeks, I created a teaser billboard, flyers, posters, newspaper ads, and a T-shirt for their annual Halloween stripping / burlesque event. The billboard was an instant success, resulting in new coverage and a ton of hits on their site! The poster and shirts sold well, and the event was an instant success! Ron Paul 2012 – Official Philadelphia Shirt Design! I was asked by someone working with the Ron Paul 2012 campaign to design a t-shirt for a Philadelphia Fund Raiser that takes place February 6th at National Mechanics. The event is being organized by Patrick Rodgers, the incredibly brilliant man who not only owns and runs Digital Ferret Records and Nocturne at Club Shampoo, but also foreclosed on a Wells Fargo branch. The brief was simple: A 3-color design for an upcoming fundraiser that showed Ron Paul, the Liberty Bell, and the headline “Philadelphia. Liberty. The Constitution.” After messing around with a few different ideas and concepts, I went with what you see here; a fairly straight-forward design with a focus on showing how presidential he is. The shirts will be available at the Ron Paul Fundraiser in Philadelphia on February 6th at National Mechanics, which starts at 6:30PM. For a small donation of $20 you get access to some great food and political discussion. 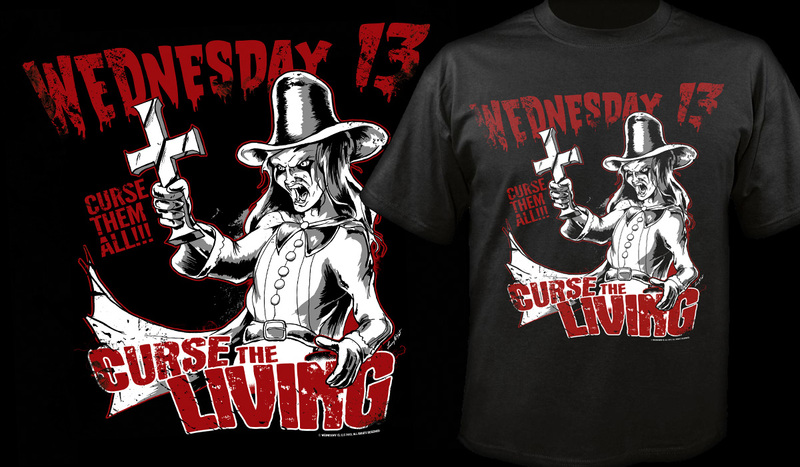 Oh, and you can buy this shirt while you’re there, too. Also, you can check out the piece itself on my DeviantArt account. The photo of Ron Paul come from Gage Skidmore, who I can’t thank enough! I did a photo shoot with two awesome goth / alt models Jernike and Chrissy in an abandoned factory in Philadelphia. It was a hell of a shoot, involving danger, hobos, blood, and dying batteries! Thrills and chills awaited us in the shoot, and I’m glad to share this with the world! Check out the full set of “Hell Needs Women” on Flickr! Live Not On Evil Gig Poster! Well, here it is: The OFFICIAL Gig Poster for Live Not on Evil! Check it out on DeviantArt! This was a lot of fun to do and I have to say Rob was a great guy to work with! We wound up going for a Punk-Rock Cowgirl for the poster, and I was influenced heavily by Western movie posters at first, which led me to a more rockabilly-meets-classic horror look to the poster in the end. For the girl we agreed it would be awesome if the end of the branding iron was the Liberty Bell to keep well of the fact that the band was from Philly. Actually, in the background, you can see the original pencil art! I talked to a friend of mine who said the original pencils were awesome and I should use them somewhere in the piece, and I figured the background was a great place to put it since it helped tie everything together. Drinking Coffee Liberally – New Poster, Awesome Group! Back in March, a group I periodically attended called Drinking Liberally decided to do something different: Instead of meeting at a bar at night, why not meet on a Sunday afternoon over coffee? The result was a larger group, lively discussions, and a lot of fun! But it was at that time that we discussed a new poster. We were “sponsored” by the national group, and they didn’t have anything for coffee drinkers. While talking, I took out my sketch book, worked out a quick idea, and everyone agreed it would be great for me to do it. Well, time passed, and the idea simply sat around, periodically being mentioned and me groaning about time or something or other. But since I was being so productive and creative, I decided now was the time to take a chance and work on the poster and see if the national picked it up. The version I did relied on the imagery already used by the organization and the original idea was to do a radial as I’ve done in a lot of my work. I passed on that idea because it just couldn’t work with the font, space, and limited color I wanted to use. This version plays off Art Deco and the same ideas and concepts used for New Deal programs under FDR. If you live in Philadelphia, namely the Mt. Airy area, please come out to Drinking Coffee Liberally! The group meets up Every Sunday at 12:30PM to 2:30PM at Infusion Cafe at 7133 Germantown Avenue. Tell ’em Larry Sent ‘Ya!